Drawing blood to recheck 007. He is a great patient. 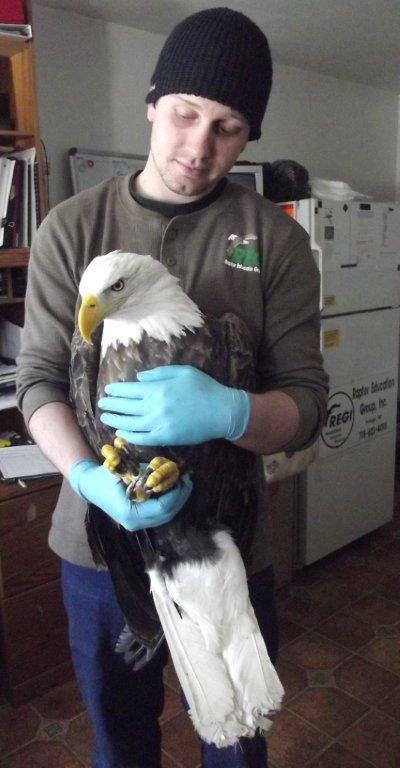 ﻿﻿﻿ We did blood work on the Lead Poisoned Bald Eagles Saturday. #007 is still at critical levels. While we are not surprised given the huge levels he had coming in, it is disappointing. The longer the lead is in the body the greater the chance for organ failure or neurological damage. He is on round 3 of chelation now. 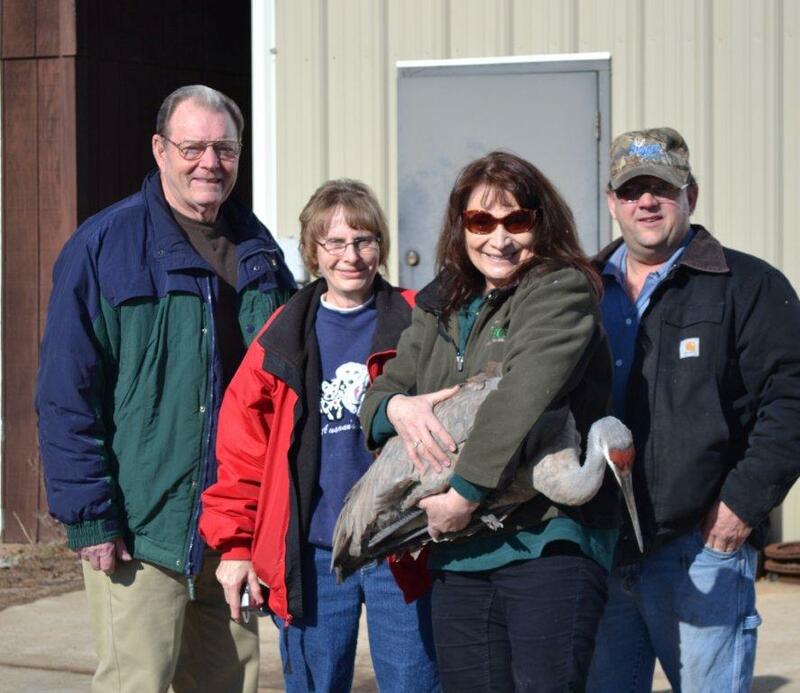 Sunday Don and I drove to Plainfield, WI to rescue a Sandhill Crane that was behaving oddly. It turns out the crane had been kept as a "pet". He is very tame and either was released or escaped from the people that raised him. His wings were clipped. That indicates the humans in his life did not want him to leave the area. It is illegal to keep native migratory birds without special state and federal permits, but even more troubling this beautiful male crane is imprinted to humans. That means he does not know he is a crane and will never be able to be free in the wild. 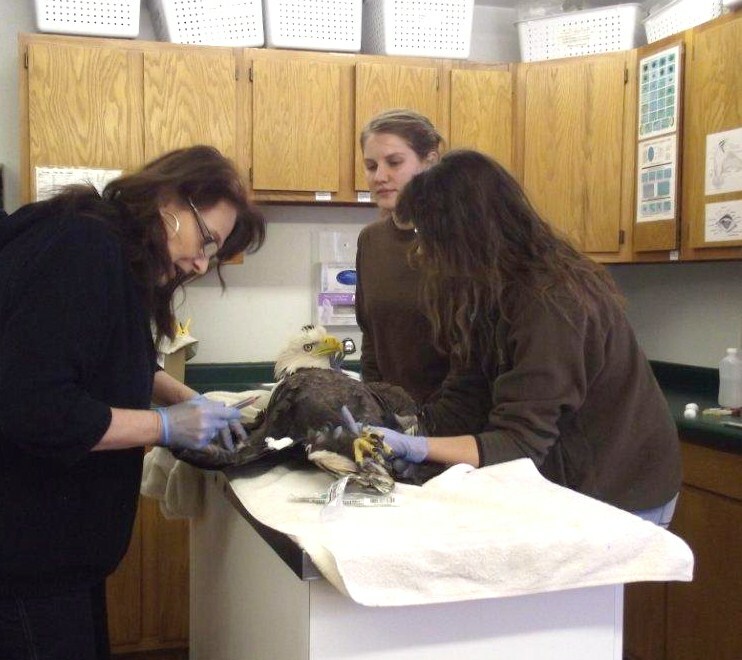 We will look for placement in a zoo or nature park somewhere in the U.S.
We have had a problem in the Portage and Wood County areas for the past several years. It seems someone is taking either very young babies or eggs and raising the chicks as pets. The folks involved are likely well meaning, but do not understand that imprinting is a permanent situation with these species. From what we have been able to put together from past years, the cranes and geese are raised with large dogs as they are playful with dogs often to their demise. They are "released" after they are grown, but because they are human imprints they have no idea what to do. They are not accepted by the wild cranes. They end up coming up to people and dogs and even coyotes, which never ends well for them. This beautiful male Sandhill Crane was raised in captivity and went to people for food. If anyone reading this blog knows of someone in that area that is raising wild baby birds or waterfowl, please either let me know or urge them to stop. From what we have put together, the person knows how to rear these species because they are well developed and have great plumage. 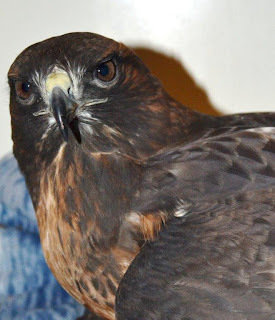 We need good wildlife rehabilitators in the area. I am willing to help these folks seek state and federal permits so they can raise chicks legally and without imprinting them to people. Please let me know. 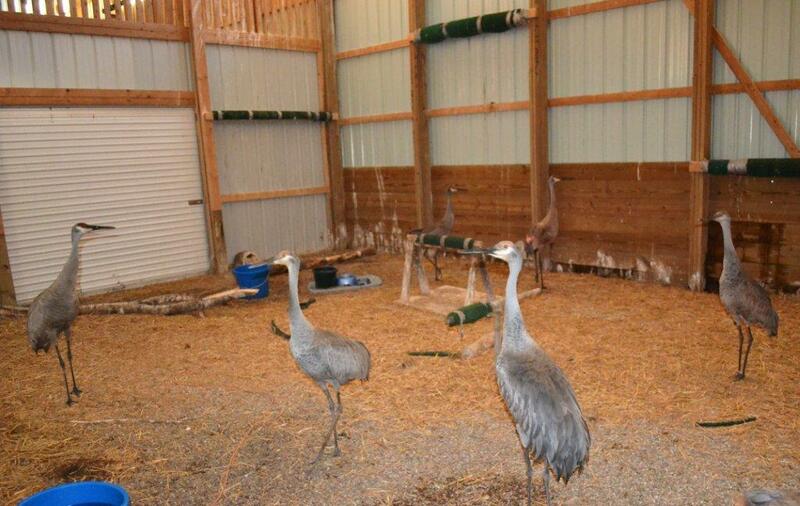 We are over-wintering ten Sandhill Cranes at REGI. The new guy is on the far left. His "brother" in in the foreground center. Our thanks to Bob Fox and Mick and Dawn Richtmyre for calling when the crane appeared at their home and keeping him safe until we could arrive. After getting him back to REGI our new male crane was very friendly with another imprinted crane that came to us from the same area last fall. They may in fact be brothers or at least were raised together. It will be interesting to see how this plays out. Our education red-tailed hawk has West Nile Virus blindness. but does a great job educating the public. It was a beautiful day with temperatures in the 30's. It is unlike weather we are used to in WI in February. 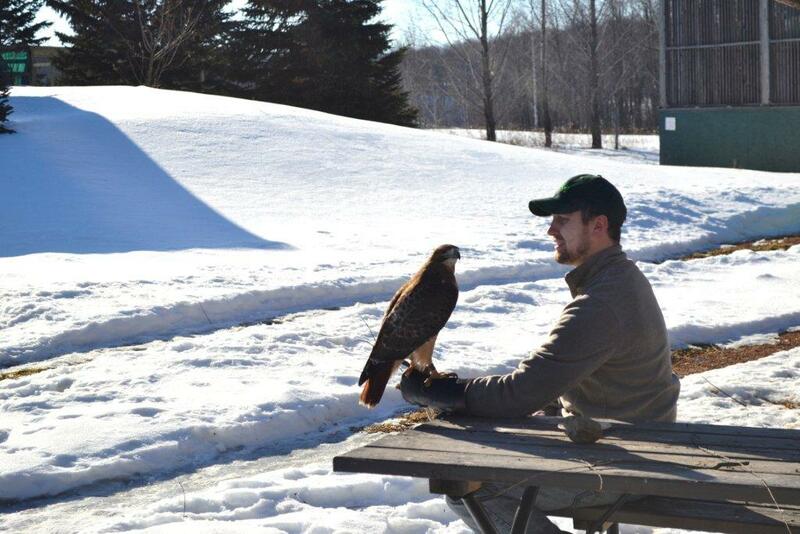 REGI staffer, Brennan Rausch took the opportunity to work with some of our education birds. I took photos so we can look back in normal years and prove that we were able to soak in some "rays" in the REGI yard during the winter of 2011-12. Many thanks to all of our REGI friends for your kind words on Juliet and her health. She is not completely well yet, but improving. She is still stunning at her age even when she is not feeling well. What a fine lady bird she is.